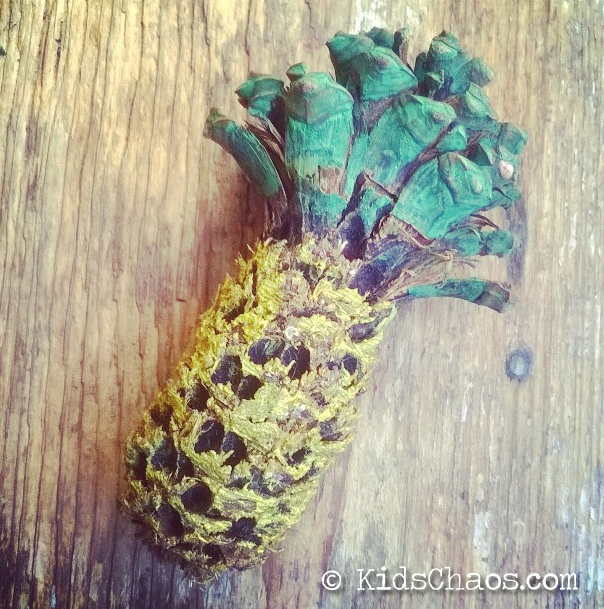 I’ve been using Fimo as a modelling clay for a very long time – back to my Art Student days when I was making rather scary necklaces, with big spiky teeth! 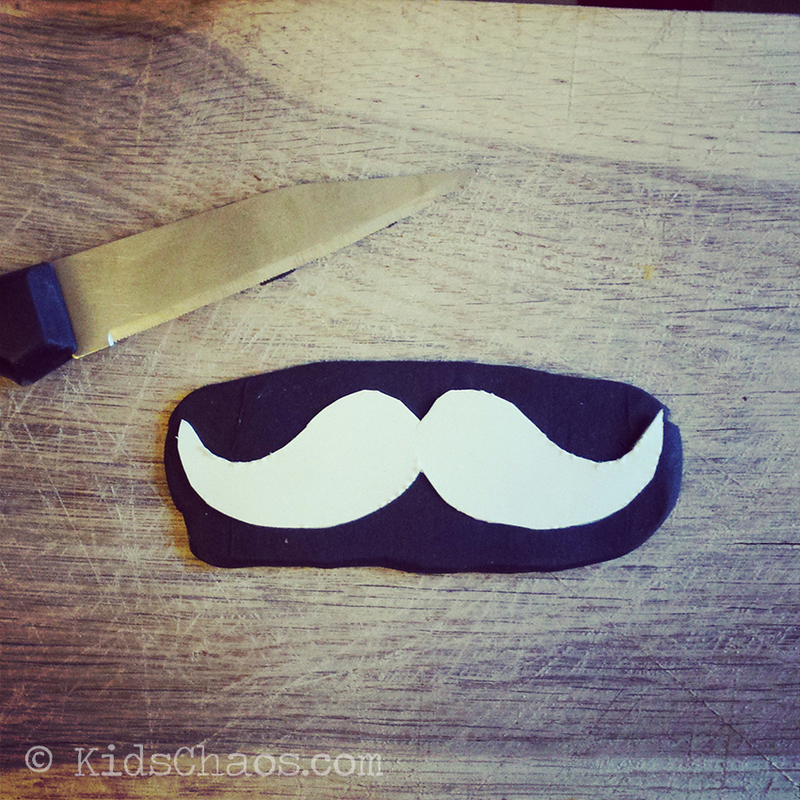 And the husband is bit of a moustache fan, so we decided to make him a Mustache badge from fimo, for a little stocking filler for Christmas. 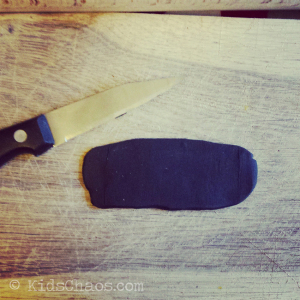 Position the template on the fimo, and cut around with the knife. Place the fimo onto the greaseproof paper and bake in the over for 25 minutes at 120 degrees. 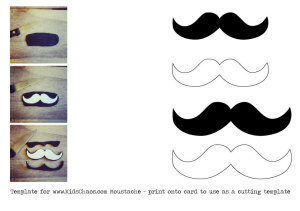 Another fab idea is to take the Moustache brooch, and pin it to the front of a folded card, and get your child to draw a face to go with it! 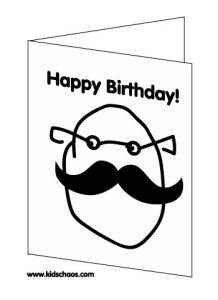 I’ve attached another Happy Birthday template KidsChaos template to illustrate just what I mean! The boys just love a paper craft, and we can thank our lovely friend Maggy for that (she told me to say that…) – Maggy taught them how to make origami paper boats when they were very little, and now at 10, the youngest is forever making Ninja Stars, Jumping Frogs and Paper cranes – and now his latest, the Traditional Paper Star. For this lovely origami traditional Paper Star you need 14-15 square origami sheets, of various colours (we tried to persuade him to make them in Christmas colours, however, he is ‘his own man’ and went with these colours!) 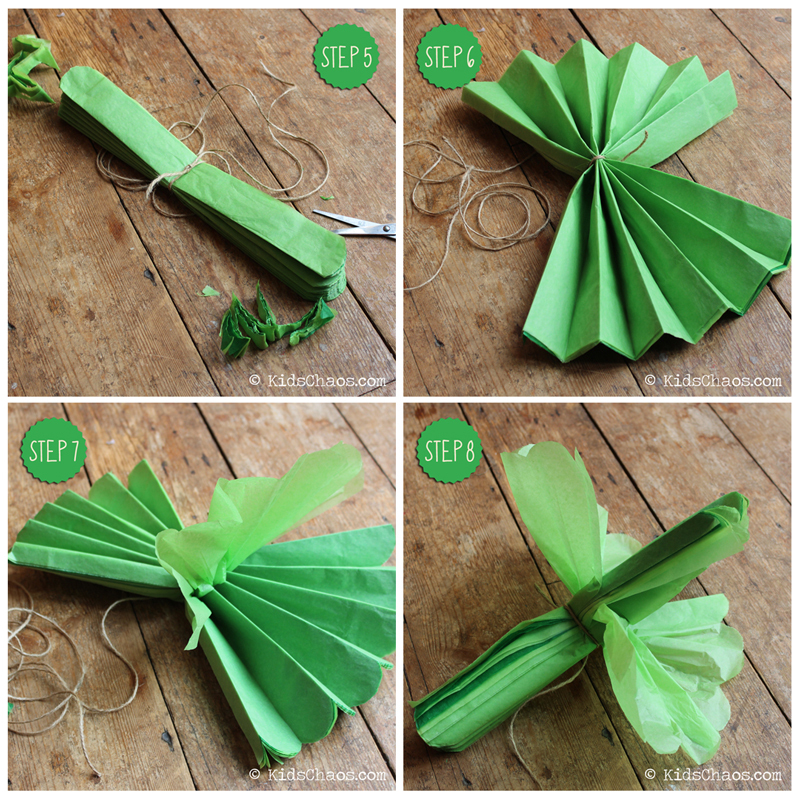 It literally only takes minutes to learn how to make this! 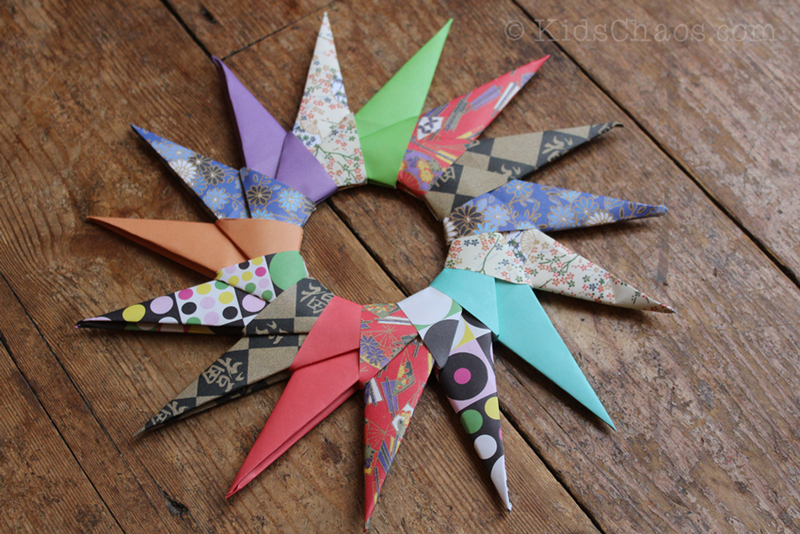 Fold each piece of paper to the long triangular shape, follow the youtube instructions linked here… demonstrated by the lovely Maggy from RedTedArt… and insert one into another until you join the first with the last to create this star shape – how lovely, we’ll be hanging this creation on the Christmas Tree next weekend! We’ve all of us got an old T-shirt lying about don’t we? 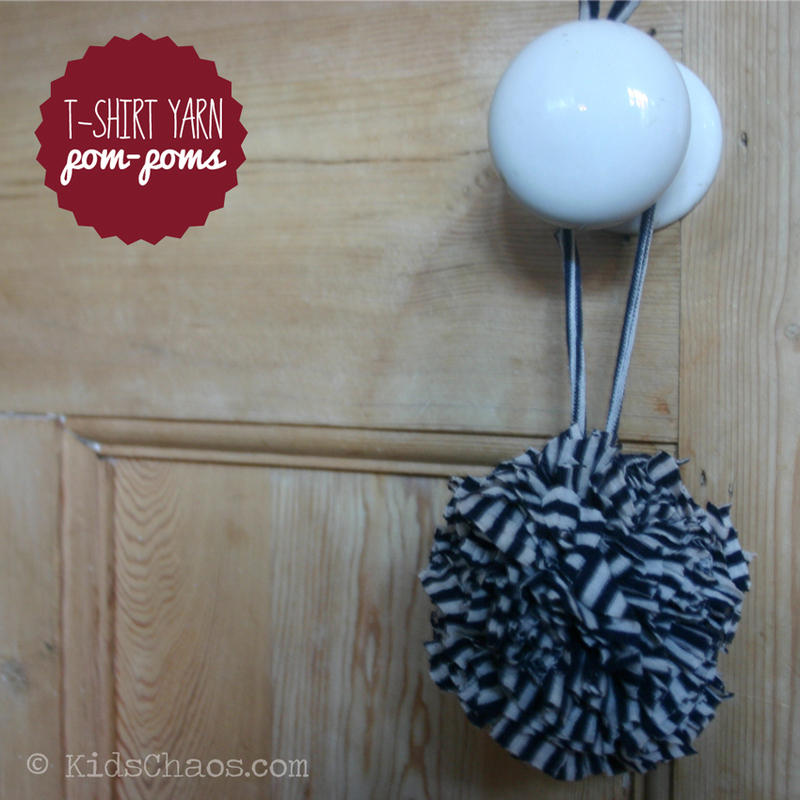 I had a very favourite, Breton Stripe T which had sadly come to the end of its life, and was just to scruffy to go to the charity shop, so we decided to DO something with it, and as we’ve gone a little pom-pom crazy this month, thought we’d have a go at the old classic – a T Shirt Yarn Pom Pom! Step 1 – using a mug as a template, we cut two circular donuts, and lay them on top of each other. 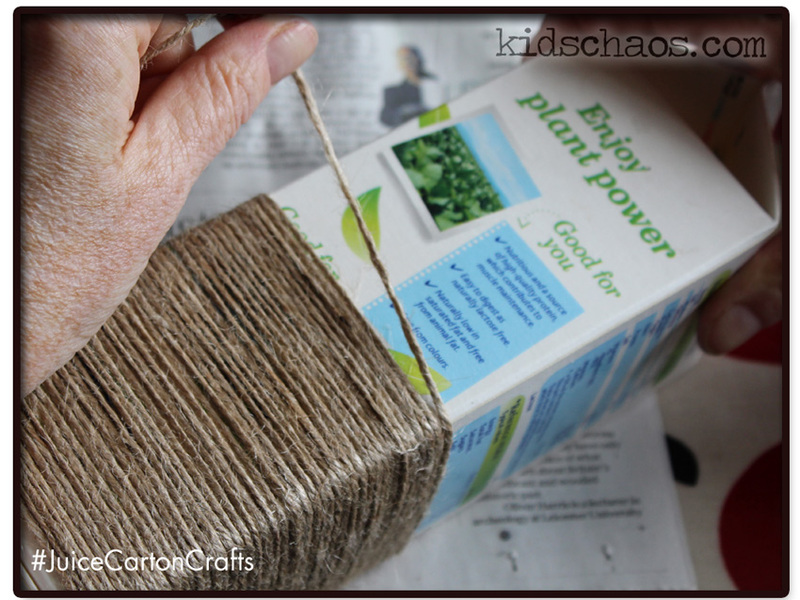 Step 2 – cut your T-shirt into long strips to make ‘yarn’ and lay one piece of this yarn between the two donuts. 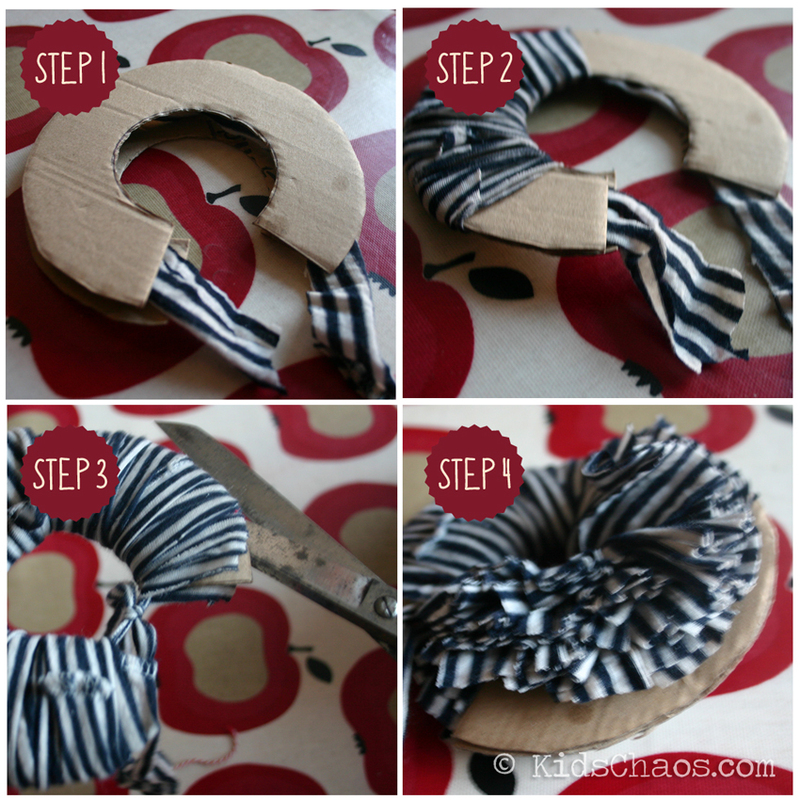 Step 3 – Wrap the T-shirt yarn around and around the donuts, and tie off the centre strip of yarn in a knot. Step 4 – Push your scissors between the two donuts and snip around the circle as you would a regular pom-pom! We love how this one turned out and will be collecting our old T-shirts to have a go and MORE T Shirt Yarn Pom-Poms soon! 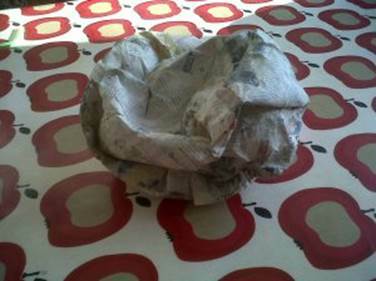 10) Keep pulling and fluffing the single sheets of tissue paper to create the paper pompom. and that’s it! – to see how you can create something quite amazing to hang in your bedroom, click here to see our crepe paper version, with raindrops! If you fancy having a go yourself click here, alternative you can purchase them here at Delights in packs of three! 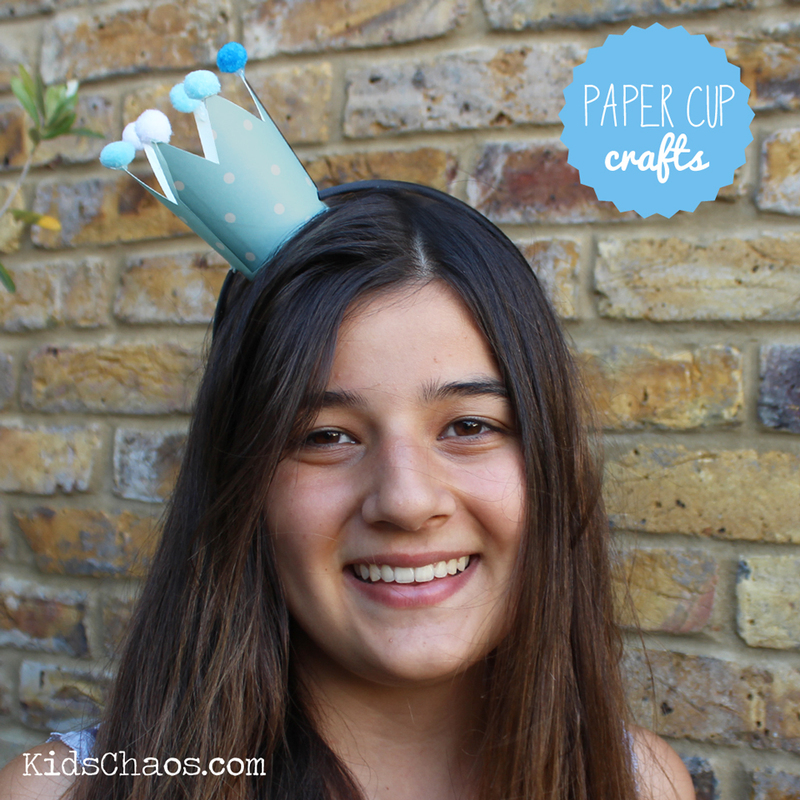 We’ve said it before, paper cups are a great asset to a store cupboard…And for no other reason that they can be VERY handy to have around for that impromptu Frozen Crown making session – what better way to spend an afternoon, making paper cup crowns, and then sitting down to watch the Frozen film on DVD! 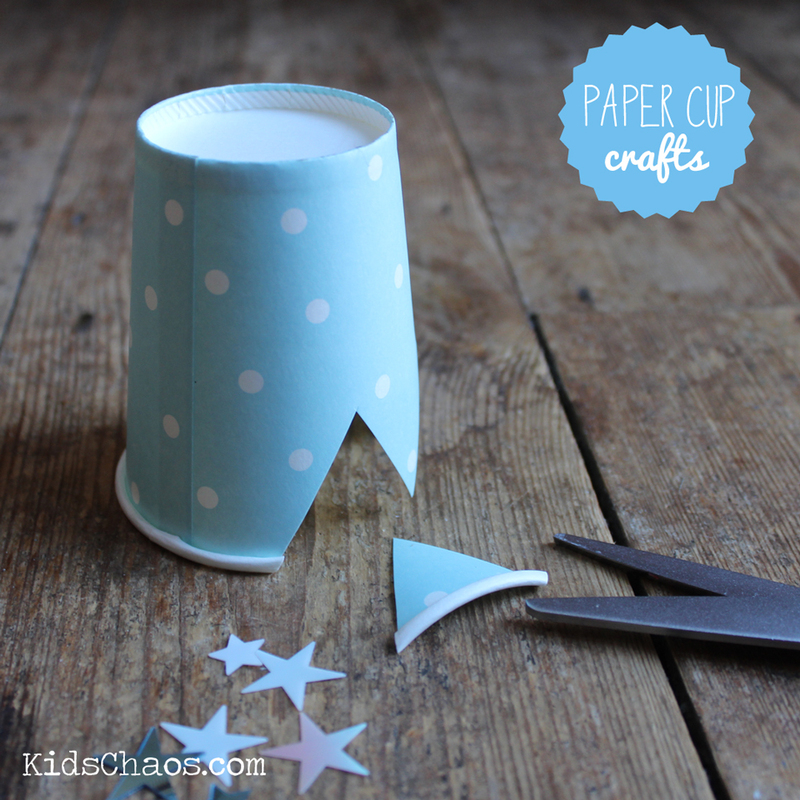 1) Cut a series of triangles around the rim of the paper cup. 2) Turn the cup to sit on it’s base, and glue the pom-poms onto each point of the triangles. 3) Using the scissors, push two holes into either side of the base of the paper cup. For more quick and simple paper cup ideas, check out our W is for Whale and Red Ted Art’s pom pom party poppers! 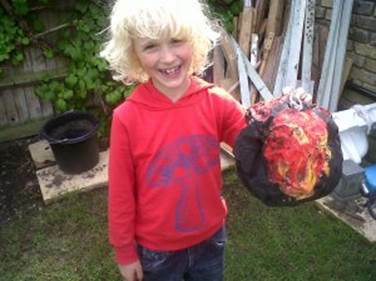 Paper cups are a great asset to a store cupboard… you never know when the post school playdates may descend on you, and for this time of year, paper plates and cups are often safer in the garden for the al fresco dining that may take place! 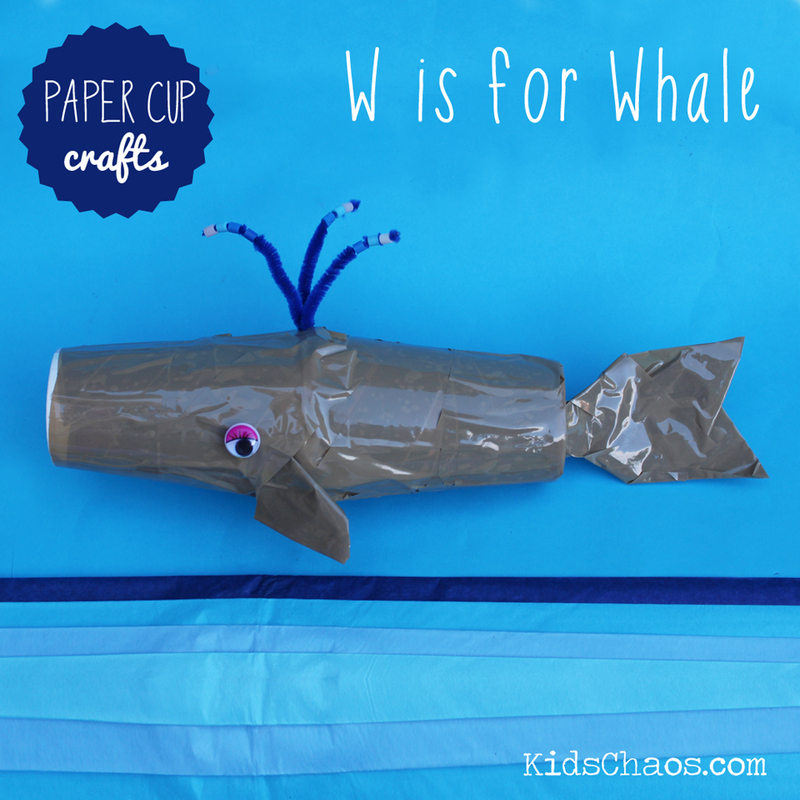 They are also VERY handy for a last minute craft session, particularly if you are practicing your alphabet crafts – and all you need for this W is for Whale paper cup craft, is two paper cups, some parcel tape and a couple of googly eyes! Hama or Perler Beads in an array of blues and white! 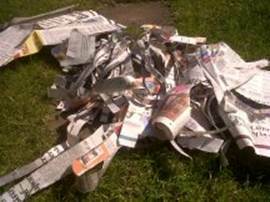 1) Using the parcel tape, stick the two cups together facing each other to create the body shape of the whale. 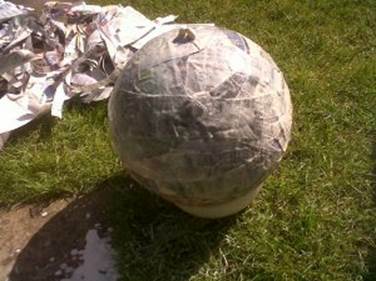 2) Wrap the parcel tape all over the body of the whale to cover it. 3) Fashion the whale’s tail from more parcel tape and attach to one end of the paper cup whale. 4) Do the same with the two front flippers, and attach just below the position on the eyes. 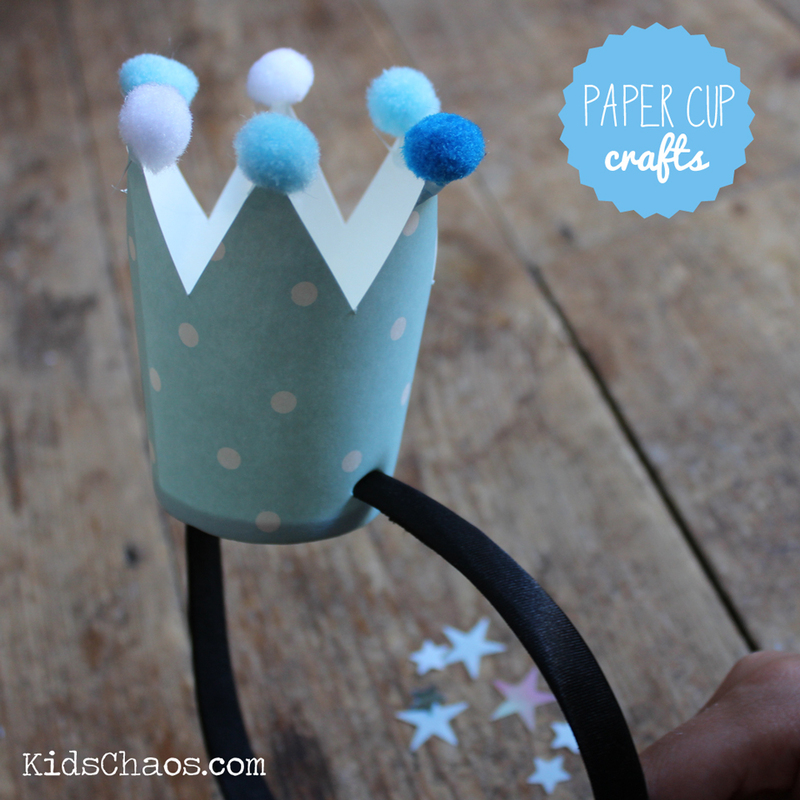 5) Add the googly eyes, essential in any paper cup craft!. 6) Pierce a small slit where the blow hole on the top of the whale’s body will be. 7) Push the pipe cleaners, or wires, into the hole, and add some Hama or Perler beads to look like water drops and you are DONE! 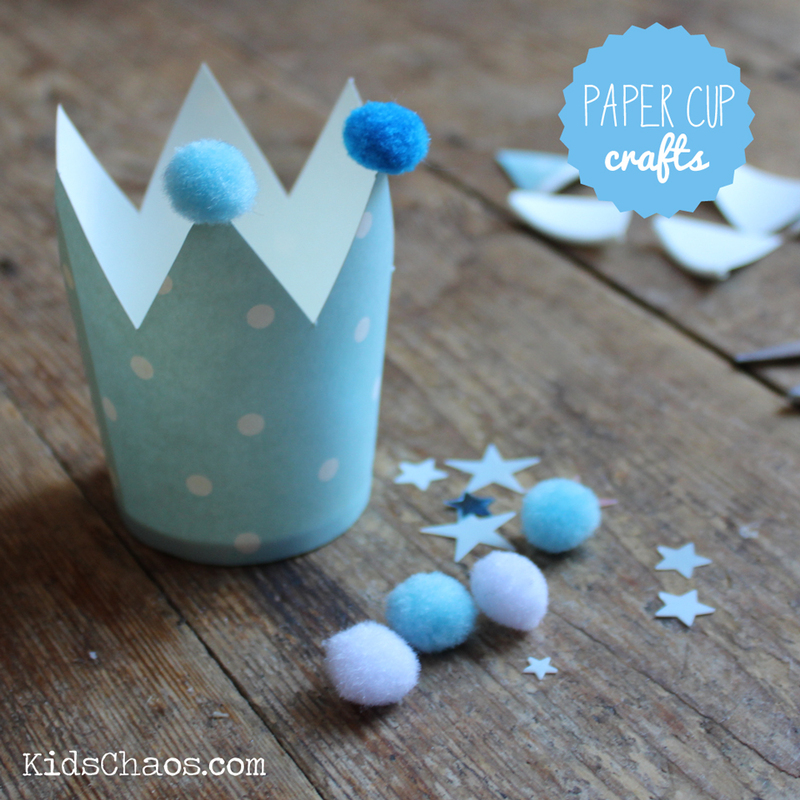 For more quick and simple paper cup ideas, check out our Paper Cup Frozen Crown and Red Ted Art’s pom pom party poppers! 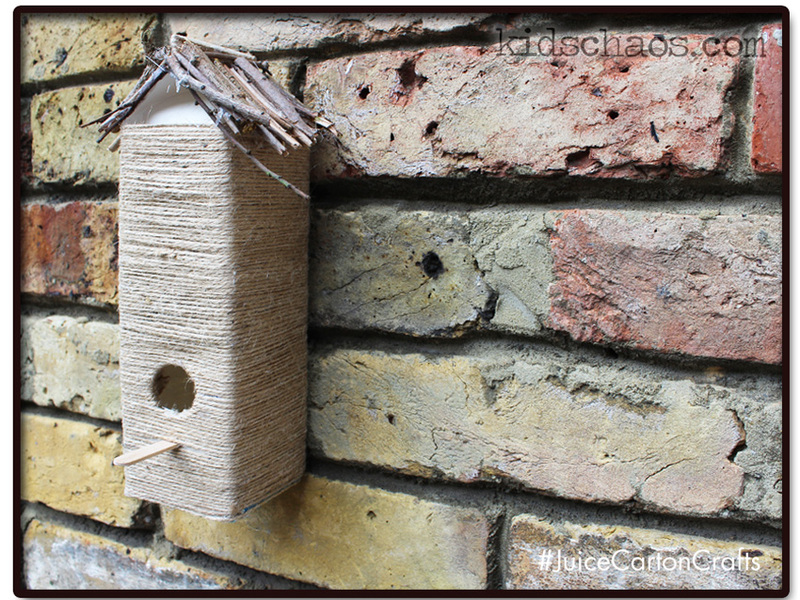 We made a Birdhouse from a Juice Carton! We do have a lot of Tetra Pak Milk Cartons and Juice Cartons in our house. I drink soya milk, and we often buy orange juice as a special breakfast treat for the kids, and to try to reach our FIVE A DAY, or is it SEVEN a day these days?! You may have seen the video on Instagram, so now here’s the ‘how to’…. 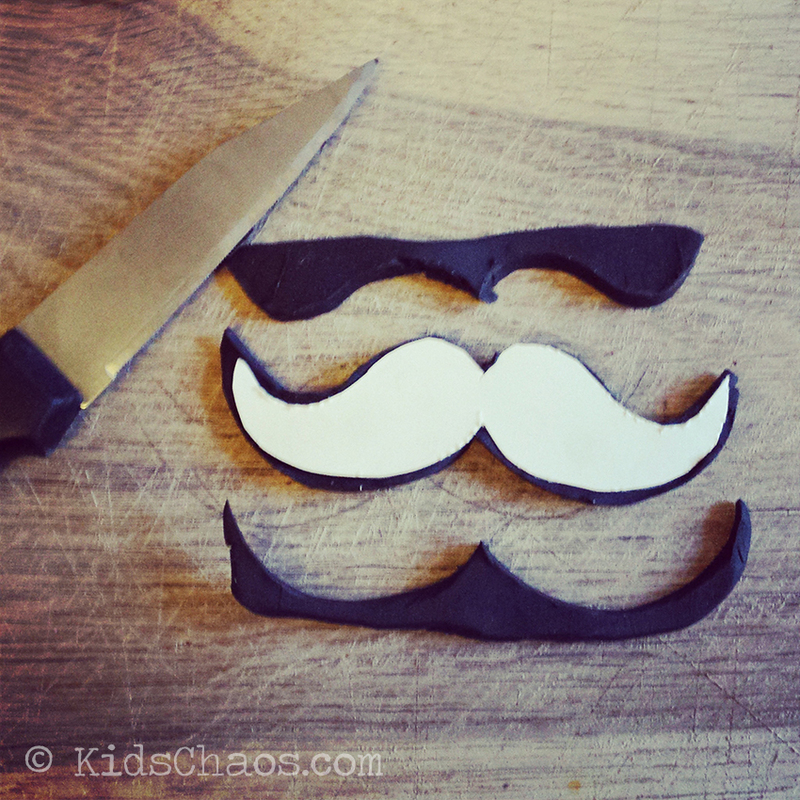 Ok…..so guess what we are making this afternoon….? Watch this little video for a clue! Anyway, we don’t throw the juice cartons away…These naturally weather proof cartons stack up on the kitchen shelf waiting patiently to be made into something via the kids’ love of junk modelling, and had a big old milk carton crafting session this weekend with Red Ted Art and family – 11yo made a Blue Narwhal night light (more on that later) 9yo made a vase, and some seedling boxes (again, more on them later) and we all had a hand in making this Juice Carton Birdhouse! 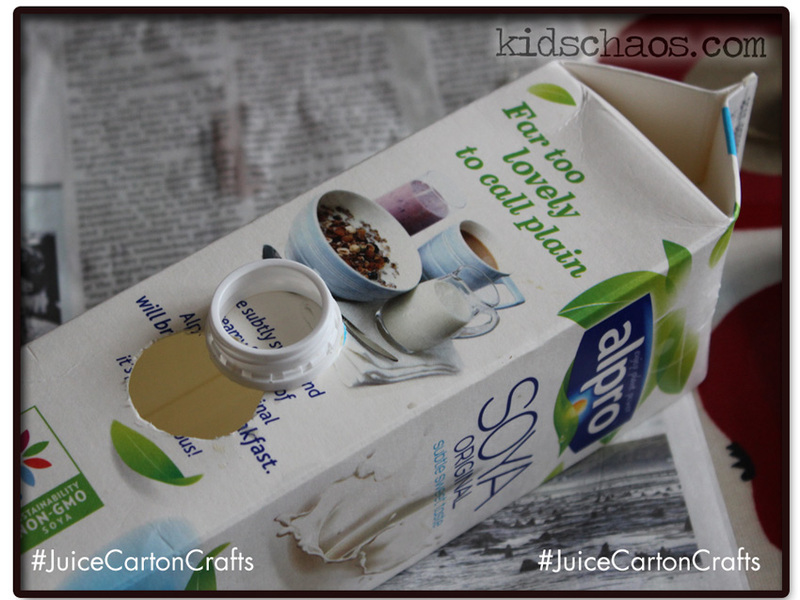 We started by cutting off the pouring spout, and using it as a circular template on the front of the juice box, to make the hole for the birds to enter the juice carton birdhouse box. 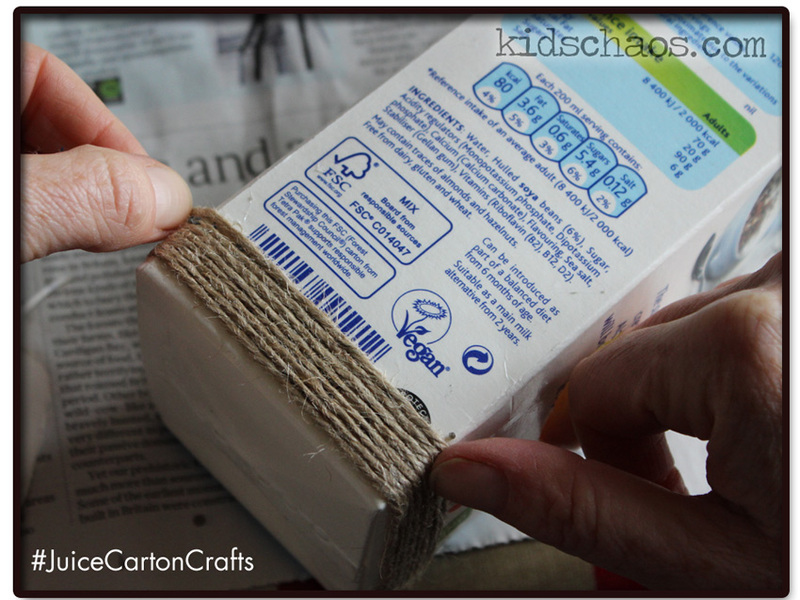 Then started wrapping string around the juice box, adding a blob of glue occasionally. We wound the string all the way to the top of the box. 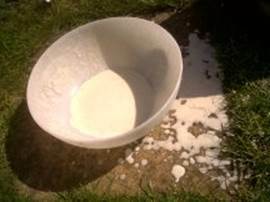 Using a section from a plastic milk carton, we covered the pouring spout hole. 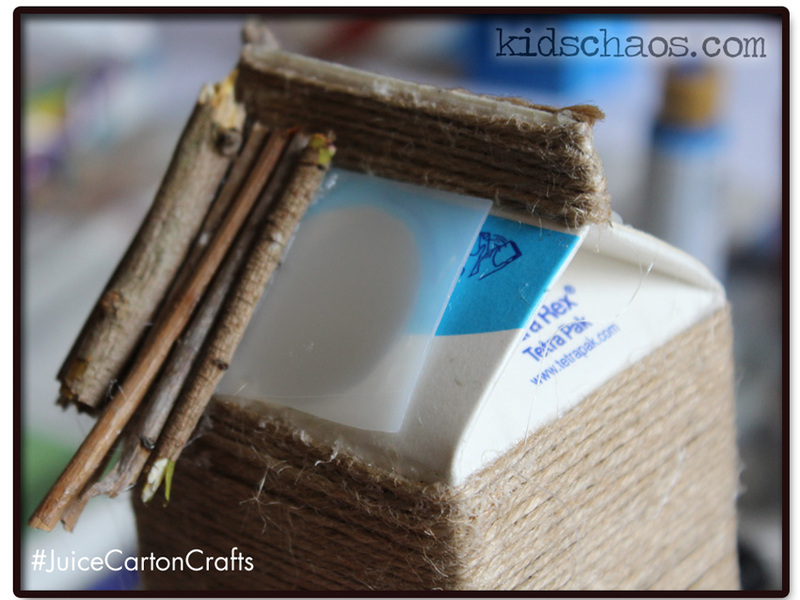 And glued pieces of broken twigs to the ‘roof’ of the juice carton to make an organic natural looking roof for the Birdhouse. 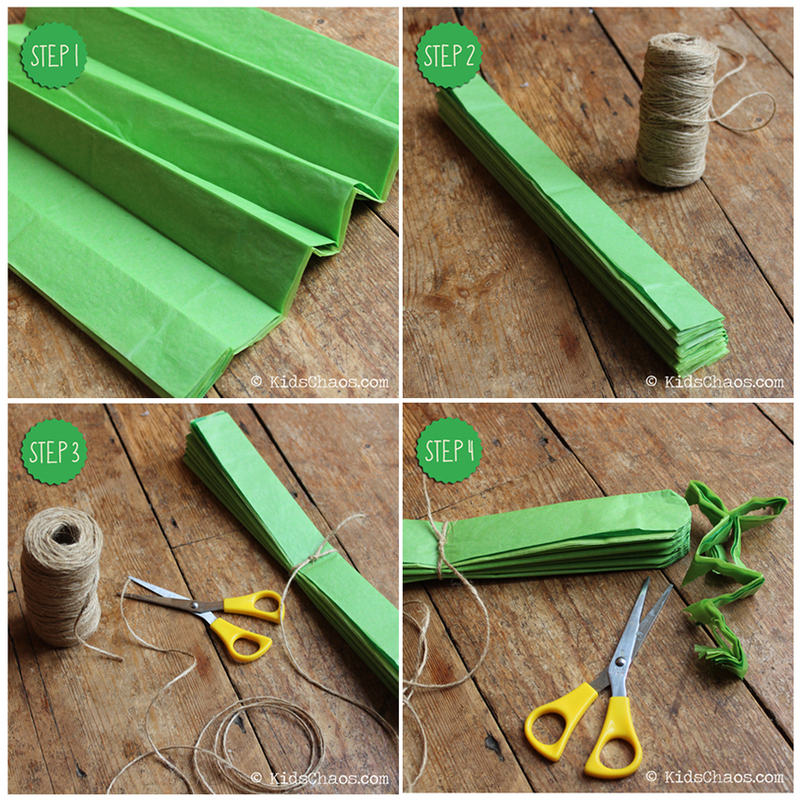 Carefully cutting the string around the bird’s doorway, and gluing back the string inside to make a smooth entrance, and adding a lolly stick below finishes the juice carton Birdhouse off quite nicely! All we need now is one of Red Ted Art‘s juice carton bird feeders and we’re away! 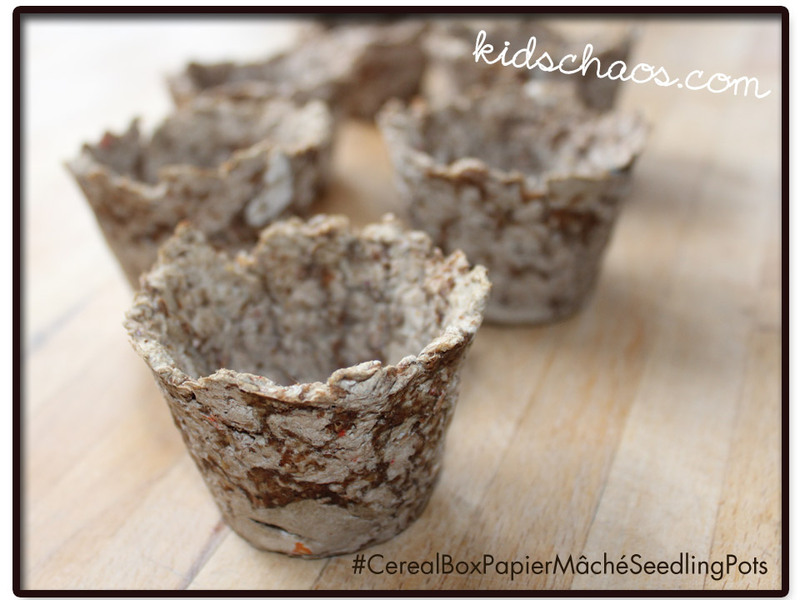 This is a really fun recycling craft to do with the kids at the weekend, and my sister has started collecting the Tetra pak’s and will be making these at Forest School next week too! If you like this post, check out 11yo’s little blue narwhal lamp which he made from another milk carton here! 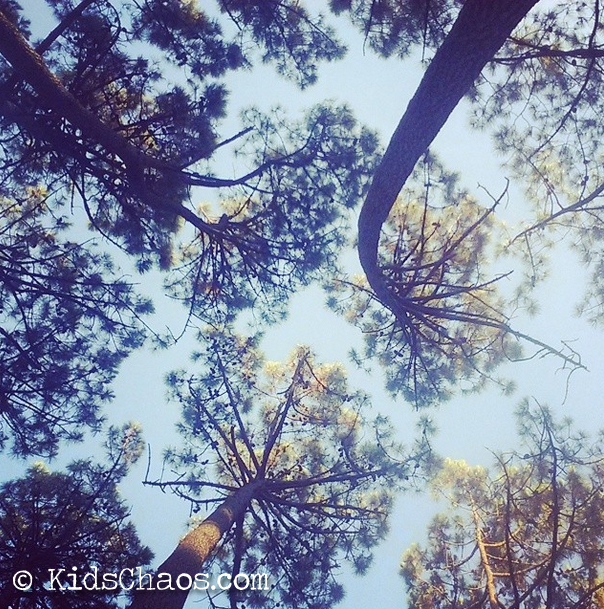 Ali also blogs over on aGreenerLifeforus.com and is a new lover of Instagram too… pop over and say hello! 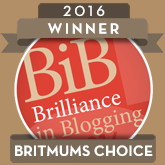 And if you liked this Craft – you’ll be pleased to hear that we’ve been shortlisted in the Britmums Brilliance in Blogging Awards – whoohey! 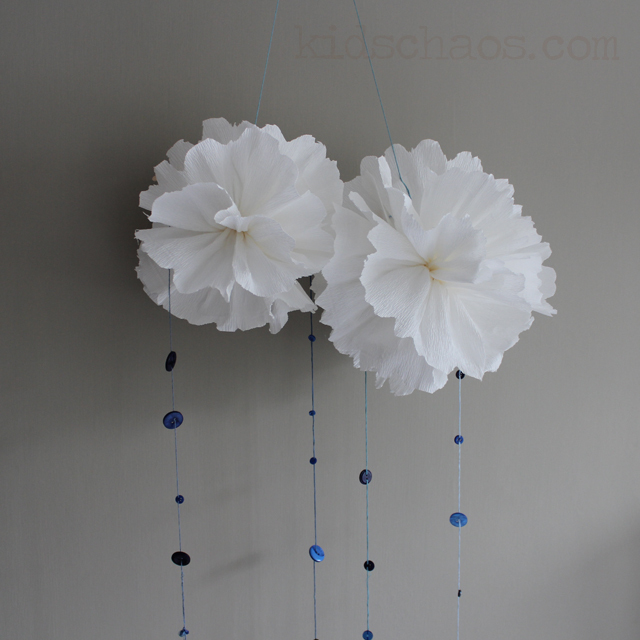 Pom pom clouds and button raindrops – we made these to hang from my son’s bedroom ceiling… coughs… they look nicer hanging against my bedroom wall though don’t you think?! 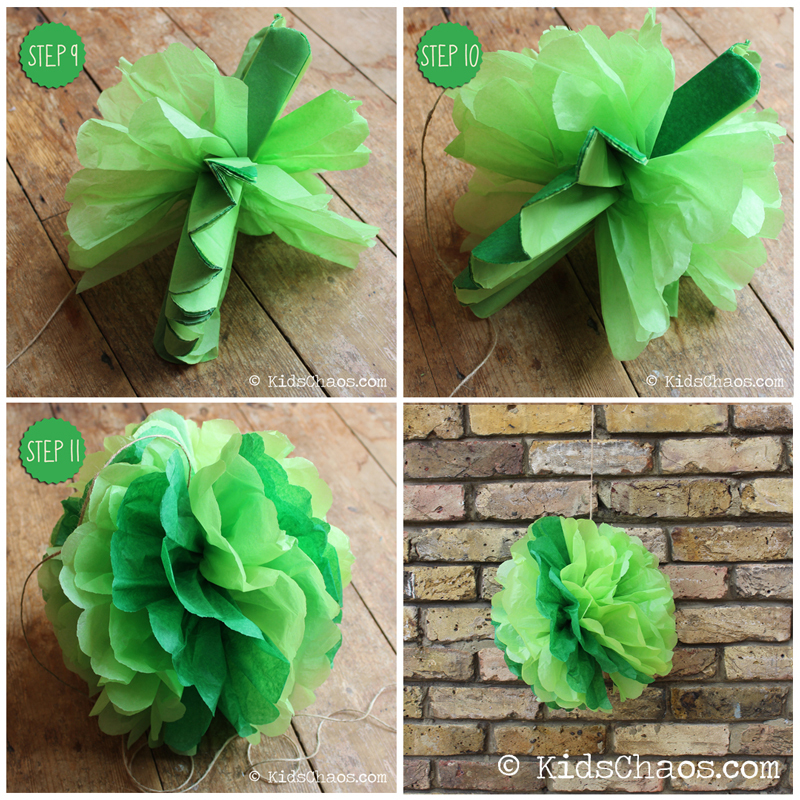 The giant pom poms are really straightforward to make, easier with tissue paper if I’m honest (we used crepe paper for these giant pom poms as we’d run out of white tissue paper) however, aesthetically they look great in the textured crepe paper. The button raindrops are really effective, choose a variety of shades of blue, and string and knot them onto some blue yarn to hang from the giant paper pom pom clouds – lovely!